Right now the afternoon sunlight is pouring through my windows in a smooth, yellow light. 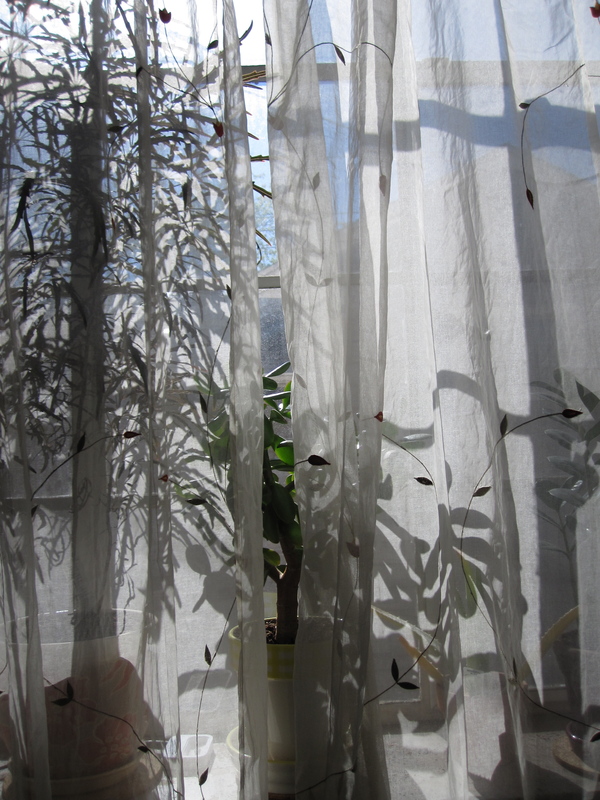 I love the brightness of it, and the way the sun throws shadows of the plants in the windowsill onto the sheer curtains. The window is open and a breeze floats through, carrying with it birdsong and the chatter of people walking down the street. This is such a lovely Friday afternoon, containing a series of perfect moments. Whenever I look up and see the yellow afternoon light making the curtains glow, I am happy. For a long time, I’ve wanted to start writing again but I’ve had trouble settling on a topic. What do I want to define me? The answer: Things that make me happy. Those things I spot while walking my dog that make me stop and look again, pull out my camera to take a picture. The moments that stand still, just for that brief instant, when I think Yes. That is how I want to define myself. On this bright Friday afternoon, I am the good things, and there are so many good things.